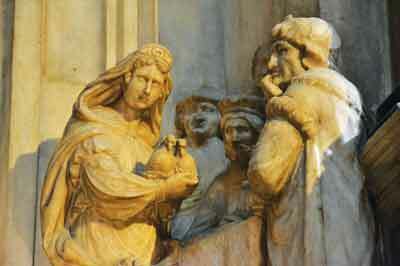 Standing at the heart of Milan, Italy is the Duomo di Milano - the cathedral of Milan. The streets surrounding the structure circle and spoke away and Duomo Square is dominated by the magnificent building. The cathedral of Milan is the second largest Catholic cathedral in the world - only Seville cathedral, southern Spain is larger. 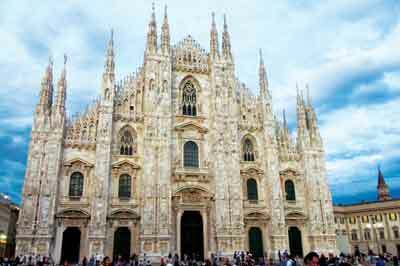 Milan cathedral is 157m long and around 40,000 people can fit comfortably inside. The cathedral was commissioned in 1385 by bishop Antonio da Saluzzo, who was eagerly supported by the first Duke of Milan, Gian Galeazzo Visconti. Originally, the cathedral was planned to use fired bricks, but in 1387 the Duke insisted on marble and the then more up-to-date international Gothic style. Visconti envisioned the creation of the world's largest church, wanting to create a majestic power symbol, so he gave access to his marble quarries, granted tax exemptions and invited architects from across Europe to aid in the building of the cathedral. Construction began in 1386 led by chief engineer Simone da Orsenigo, but it would continue for centuries, right up until 1813 and the final finishes were applied as late as 1965. The grounds on which the cathedral was built had previously housed Saint Ambrose basilica at the beginning of the 5th century - the 'basilica' having recently been identified as a church. A second basilica was added in later years, but due to fire damage in 1075, the two basilica were rebuilt as the cathedral. Over the years, thousands of specialised workers became involved in the 'fabbrica del Duomo' - the construction of the cathedral - which meant the initial design was constantly altered. The overall look of the cathedral today can certainly be categorised as the Gothic style. Not only is the pink-hued, white marble faÃ§ade spectacular, but the interior is stunning too, with hundreds of carved statues, a myriad of half bust sculptures and numerous stained glass windows. The cathedral spreads over a surface of 11,700 square metres and 'preserves the memories of the city'. Within the cathedral walls there are five large naves, divided by 52 pillars, to represent one for each week of the year. These pillars support the cross-vaulted ceiling of the cathedral. 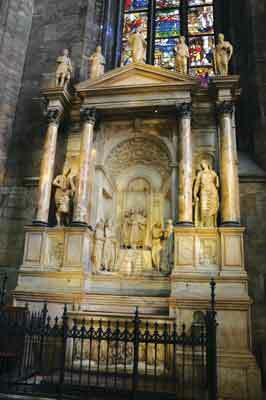 Of the hundreds of statues, some in particular should be noted: a statue of St. Bartholomew by Marco d'Agrate and three grand altars designed by Pellegrino Pellegrini, all of which include some works of art of their own, such as the renowned 'Visit of St. Peter to St. Agatha Jailed' by Federico Zuccari. Other masterpieces within the cathedral include a Renaissance marble altar in the right transept and the Trivulzio Candelabrum, the base of which was crafted in the 12th century and features imaginary animals, vegetables and vines. It can also be noted that there is a spot above the apse that is marked with a red lightbulb. This is supposedly the spot where one of the nails used in Jesus' crucifixion was placed. This grand cathedral in the heart of Milan is still not finished, as even now some uncarved blocks remain to be turned into sculpture.